We are a specialist tyre provider, not merely a garage that can supply you with tyres. Our trained fitters are able to advise you on what replacement tyres might suit your application and budget. We are able to find tyres to suit your vehicle at a competitive price, fit and balance it. We are able to legally dispose of your old tyres. Some of our customers request that we seasonally fit their summer or winter tyres to their vehicle, enabling them to stay safe on the roads whatever the conditions. 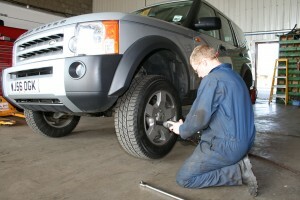 Please call our Chard tyre fitting centre 01460 64468 so that we can the tyres on your vehicle organised. We fit Pirelli, Michelin, Falken, Enduro, Goodyear, Dunlop, Continental, Vredestein, Bridgestone, Avon, BF Goodrich, Uniroyal, etc.